Just what the title says; crocheted Ood! He's my first, so he's not exactly perfect...but I'm pretty happy with him. Whatchu think, Doctor Who fans? Looks great Starrby! It must of been a hard job, and it must of taken a while to make! Hahaha! Love it! So cute! Yay for the Ood! Are you creating these "patterns" as you go? They are super cute! Aw their cute, I really love stuffed crochet animals! I always thought they would be cool to make but I never was good at it. When I get better at bodies I'll make the Doctor(s) but until then I'll be honing my skills on bad guys! On my to-do list are Daleks, Cybermen, and of course, Cassandra the last pure-blood human. XD Any fellow Whovians care to make more suggestions? OMG STARRBY! ~Makes grabby hands~ I SOOOOOOOOOOOOOOOOOO WANT ONE OF EACH! 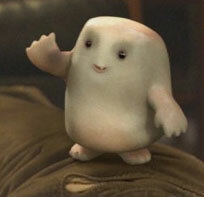 I love The Ood and don't even get me STARTED on Adipose! OMG! They are so adorable, you are very talented!!! Stop right there. Those are my 2 favorites. I would definitely purchase those if you create them! Hmm... do you think you could crochet a Tardis for when you attempt to make the doctors?